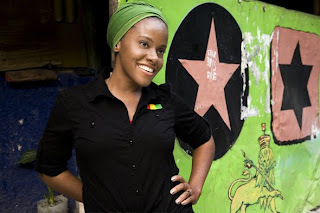 Reggae songstress Shauna McKenzie better known as Etana is this week introducing her brand new single dubbed "August Town" to the world. The song which is a lyrical re-enactment of actual events that occurred in the St. Andrew community can best be described as a chilling tale of the excessive and sometimes unnecessary use of force by Jamaican Police. According to Etana everything about the song is real. "August Town is a song about an incident that occurred in the community recently where a dance was going on and people from the community came out to eat some food and enjoy themselves and then the police came on to the scene and for no apparent reason just started firing shots which mash up everything, and even though this happened in the community where I grew up similar circumstances can be heard happening in other communities across Jamaica". Known for other inspiring and though provoking songs like "Wrong Address", "Roots""I'm Not Afraid" Etana says she felt the urge to record the song because often times the communities don't have a decisive voice. and "I fell like alot of times the communities are silenced and fearful of the police so people might not hear what really happen in some cases on the news so I decided to tell it like it happened and when you listen to the song you can hear the gunshots which bring across the realness of what transpired".